Experience the 'Old Florida' feel at this renovated 4-bedroom, 2-bath vacation rental home in Yankeetown! With enough space to sleep 10, this nautically furnished home offers a rustic coastal vibe, a Florida Room, 75 feet of seawall, and a screened lanai ideal for summer days! Whether you fish on the Withlacoochee River or explore the Crystal River Park, this is the perfect Central Florida retreat! 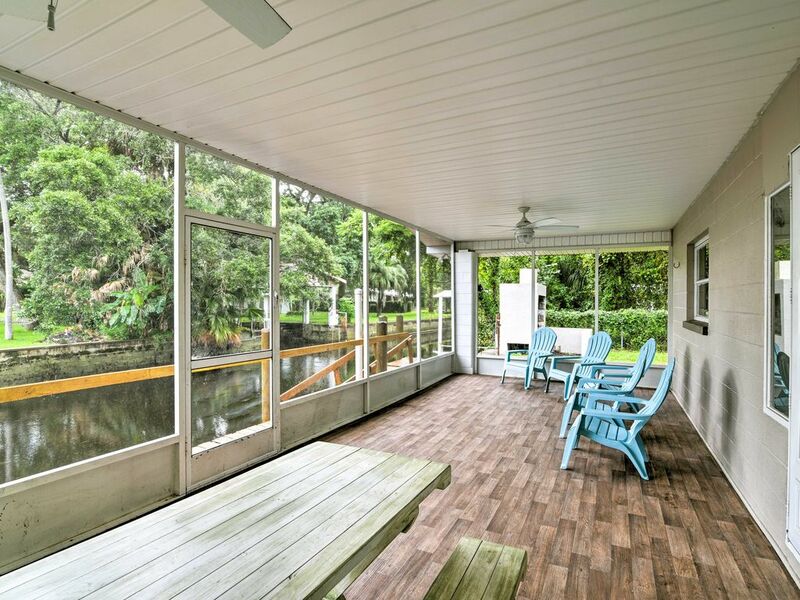 Nestled on a tranquil canal that feeds into the Withlacoochee River, this modern single-story home has been remodeled from top to bottom and features brand new furnishings! Spend your days exploring historic Yankeetown and your evenings sipping sunset cocktails in the Lanai. Step onto the tile flooring and smile as you gaze out at the nautically themed décor and calming seafoam-green interior. Fix yourself a hot cup of Keurig coffee and plan out your agenda with your crew from the comfort of the living room sofa. From the coral-themed carpet to the antique fishing net on the wall, you'll love every detail in this riverfront home. When your stomach starts to growl, make your way into the fully equipped kitchen to prepare a bite to eat. Outfitted with stainless steel appliances, sleek granite countertops, and all of the essentials, this kitchen makes it a breeze to whip up your favorite recipes! The 8-person dining table is ideal for your formal meals while the lanai is perfect for dining al fresco. Store your freshly caught seafood in the on-site deep freezer and grab some ice from the commercial ice machine to make some tropical drinks for your travel companions. Finish off the night by watching your favorite movie on the flat-screen cable TV in the living room or stargazing from either the Florida Room or the Lanai! As you start to feel your eyes get heavy, retreat to one of the 3 comfortably furnished bedrooms and drift to sleep on the cloud-like mattresses in each room. Additional accommodations can be found for up to 2 guests on the comfortable sleeper sofa in the living room or the den. The Withlacoochee Gulf Preserve is located about a 1/4 of a mile away from the house and offers 413-acres of stunning preserved land. The facility boasts over 5 miles of gorgeous walking trails, a kayak launch, and a 30-foot observation tower for even more scenic views. Fishers are in luck because this property is just across the street from the Yankeetown Marina. The Marina offers bait, lures, and a variety of other goods and is a fantastic spot to watch the fishermen take pictures of their daily catch! The marina also has a loading and unloading boat ramp if you've brought your own fishing vessel with you. When you're not eating at the house, head out the door to enjoy a meal at one of the local eateries nearby. Some favorites of the town are Blackwater Grill, Gracies, Momma Sally's Family Restaurant, and Shrimp Landing. Some other ideas for fun while you're in Yankeetown include biking along the Felburn Park Trailhead, visiting the Crystal River Preserve State Park down south, or booking a deep sea fishing trip into the Gulf! - Amenities include a fully equipped kitchen with stainless steel appliances and granite countertops, 2 flat-screen cable TVs, a den, a flat-screen TV with an Amazon Firestick, charcoal grill, private dock, boathouse with a Florida Room, a screened lanai, complimentary linens and towels, free WiFi, in-unit laundry machines, patio with a picnic table, driveway parking, and more! - Fantastic Yankeetown Location - Nestled on a canal that feeds into the Withlacoochee River, across the street from the Yankeetown Marina, a 1/4 mile from the Withlacoochee Gulf Preserve, and close to delicious restaurants, grocery stores, bars, fishing, hiking, ATVing, biking, rafting and so much more! We had a wonderful stay. The house is beautiful and comfortable, just right for a relaxing week with the family. There are many things to do in the area , or go nowhere and just fish off of the dock. This house was very comfortable, clean and inviting. We enjoyed a siblings’ reunion and the both the home and surroundings enhanced that trip. It is clear that the house has been renovated recently and was thoughtfully furnished. We thoroughly enjoyed sitting on the lanai which is alongside the canal and had fun checking the crab traps daily even though we didn’t get any. (Peck’s Old Cove in nearby Ozello has great crabs in addition to other great seafood). I wouldn’t hesitate to recommend this property to anyone. The house is so cute and decorated perfectly! We loved our stay and will be back again. I have written and tried to email the entire time I was there as well as numberous times since I've been back - doesn't seem to go anywhere or email is sent back. Really don't think anyone wants to know. We enjoyed some things about Yankeetown area. Not where this house was. The updates on the house were great, but not user friendly = we could not regulate the temperature of the house, the TV's were fancy and new but we had no idea how to work them & there were no instructions, one stayed in Spanish cause I couldn't change it and we don't speak Spanish. They had failed to provide tables around sofa so we used (White material ) chairs. BUT the biggest problem was you had to go outside and into another building to see the canal and the yard between and on side had not been cleaned up from several storms, dangerous for us and our dog to walk. I knew it had a boat house but did not know that's where the porch was - I thought boat houses were over the water so boats could go in. For the first time we were disappointed. Oh and when we got there - the linens were in a pile on dining room table, someone came over and 'cleaned' and put linens on bed & in bathroom. No idea if this was clean linen on the table. I did try to notify VRBO but seems to be impossible. Oh and the top of this review won't unpick I Loved it. when No I did not. Clean! This was a beautiful home. We ate at Blackwater Grill went on a tour with Capt Rick and Buddy what a wonderful adventure. Went to Crystal River swam with the manatees. Then went to Tarpon Springs enjoyed the day. This is a quite place and close to everything. The house is just beautiful and very clean will be back.